crazyfreakingfabulous | A Crazy, Fun and Absolutely Fabulous Mix of this and that! A Crazy, Fun and Absolutely Fabulous Mix of this and that! We recently made a trip to Jim’s Apple Farm and the largest candy and Soda Pop store in Minnesota. There we found over 100 different kinds of flavored soda, and all the candy you’ve ever heard of from the 80’s and 90’s. Stuff I didn’t think was actually made any more. We decided to try several different kinds of soda, and we’ve been testing one a day for the last 2 weeks, and today we finally got up enough courage to try Bacon Soda. The sign above it at the store jokingly (we hoped) called it carbonated bacon grease. We decided today to give it a try. We took the top off, took one whiff and it really did smell like bacon grease, which turned my stomach immediately, but I’d come this far, I had to try it. I can honestly say that we will not be buying that again, however it was a lot sweeter than I expected Almost like a candied bacon. We passed the bottle around the house so each of us had a sip, and then we happily dumped the rest of it out. We do plan to make a second trip to try the ones we didn’t purchase a few weeks ago. There are at least 100 different kinds, and many were somewhat weird, or unusual, but we have found some really good ones, like this Cheer Wine. Which has a cherry coke/Dr. Pepper taste to it, only much better. Each bottle is made with cane sugar instead of corn syrup, and they all come in a glass bottle, reminiscent of the days the Coke and Pepsi came in glass bottles. So it brought back memories as well, even the ones that didn’t taste as good. If you’re looking for something fun to do this fall, make a trip to Jordan, Minnesota and check this place out. It’s worth the drive, and a little trip down memory lane. 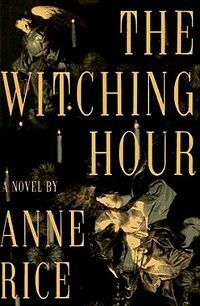 I’ve recently began reading the Witching Hour by Anne Rice again. I read it for the first time in 2000 and I remember picking up that big book and thinking I would never get through all 1056 pages, but at the same time loving the feel of that huge book in my hands. The Witching Hour centers around the family of witches, in New Orleans, known as the Mayfairs, and they are connected to the legacy of a ghost named Lasher who bonds with one female of the Mayfair family from as early as the 1600s when people were being burned alive for being a witch to present day Louisiana. When the female Mayfair he has attached himself to dies, he takes up with her daughter until she dies and then moves again to the next in line, right up until now when he has attached himself to the main character, Rowan Mayfair. Lasher provides the Mayfairs with riches beyond their dreams, but it all comes with a awful price for each member of the family. The story of Lasher is a mystery, and a Paranormal Group known as the Talamasca have followed this family and their ghost since the 1600s to present day when Rowan Mayfair (who was adopted and grew up in California and knows nothing of her families history) takes responsibility, when the mother she never really knew, dies. No one really knows where Lasher came from and it’s up to Rowan to figure it out with the help of the Talamasca. There is an enormous amount of complex historical information related to the Mayfairs, but it is told so well that you’re immediately caught up right from the start. There are several more books in the series that I will eventually re-read as well. I don’t usually re-read books, but the Witching Hour came across on my Kindle and I remembered how much I loved that book and the stories that were told in it. It’s 1056 pages long and has kept me busy for hours at a time the last few days. I vaguely remember the premise, but I’m now remembering why I loved it so much the first time I read it, over 10 years ago. 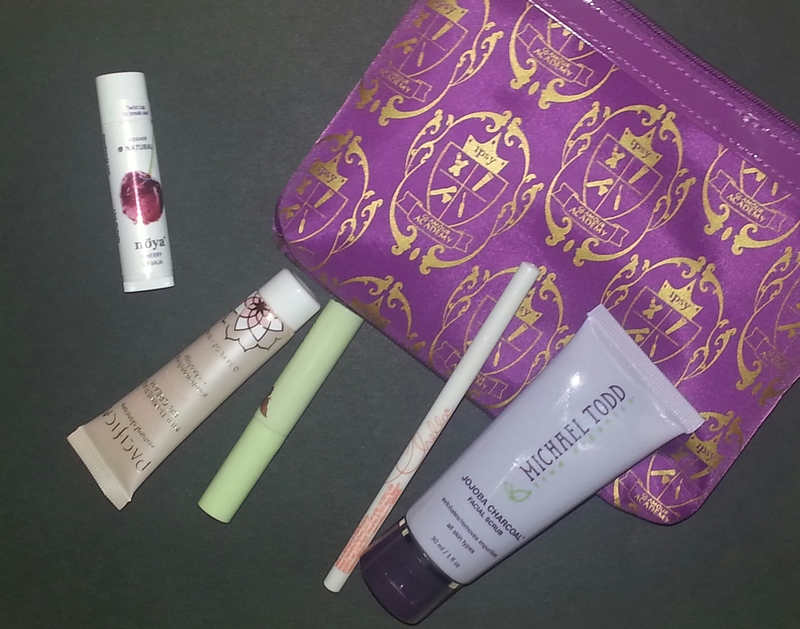 One of the more fun things I’ve done for myself this year, was sign up for Ipsy’s glam bag. It’s a make-up subscription for 10.00 a month, and each month is always a surprise. I get a cute new make-up bag with at least 5 name brand (sometimes full size) products such as eye shadow, eyeliner, blush, lipstick, lotions, and hair and nail products. I look forward to it each month, and for just 10.00, it’s worth it, and gives me something to look forward to each month. You also get a discount if you like a product and decide to buy the full size version on Ipsy’s website. If you enjoy this kind of thing, I would definitely consider doing it, however there might be a waiting list for Ipsy. If so, there are several other companies that do the same thing. Click here for an article that may help you decide which make-up subscription would be best for you. I’m loving this yarn I’m using on my latest project. It’s Premier Yarns, Serenity (chunky). I’m following a tutorial on Youtube for a scarf. The yarn is really soft and easy to work with. I’m thinking I’d like to make an afghan with it, but haven’t found the right pattern. 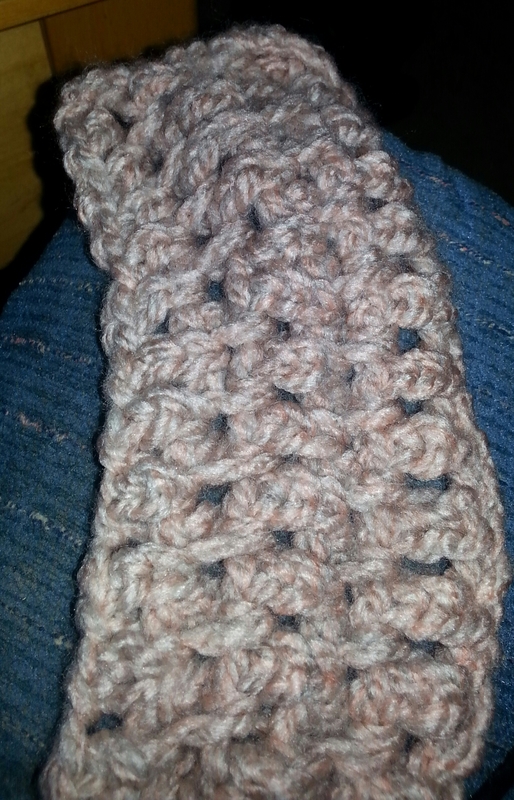 I’m not all that adept at doing anything fancy with my crocheting. But I can manage a scarf that will keep me warm. This is the first project where I am actually making something for myself instead of someone else. This has got to be one of the funkiest mascara wands I have ever used. I was excited to get it because the picture made it look big, easy to use, and would give me long full lashes. The reviews were relatively good too. When I got it, it was this tiny little thing. 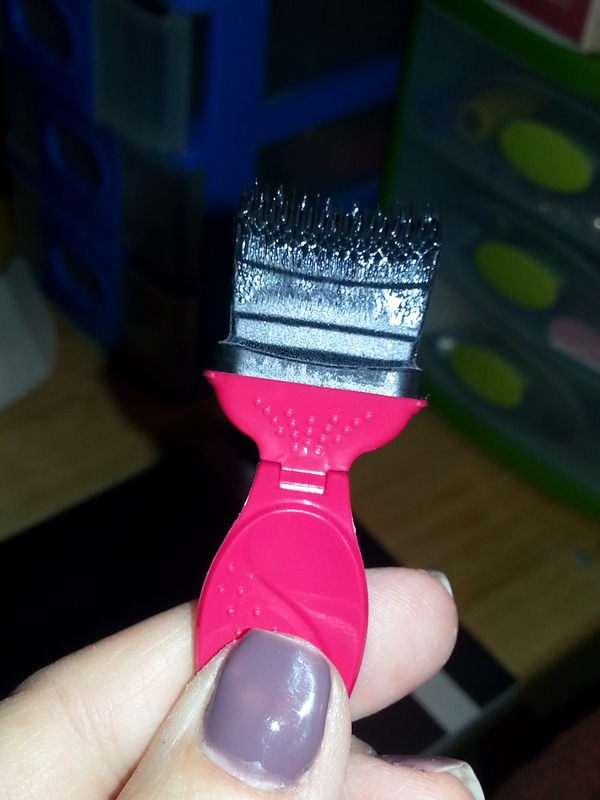 I used it yesterday and it’s kind of like a paint brush. I may have a little more length to my lashes and they look nice, but there really isn’t that much of a difference than if I had used another easier to use mascara wand. I spent 10.00 on it, but now I see it’s marked down to 4.50. Even so, I don’t think I would buy this again. Ok, I lied, I was going to make the Inside Out Carrot Cake, but I had an attack of nostalgia for these instead. I used to make them as a kid during the summer. There is a batch cooling on my kitchen counter right now. 1. In a medium saucepan, combine sugar, milk, butter, cocoa (I tend to go a little heavy on the cocoa) and salt. 2. Heat to boiling, stirring frequently. 3. When it has reached a rolling boil, cook for 5 minutes, stirring constantly. 4. Remove pan from heat and mix in vanilla, oats and coconut. 5. Drop by spoonfuls onto wax paper. It’s been awhile since I’ve made this, but I think it’s on the agenda for this weekend. Put oven racks in upper and lower thirds of oven and preheat oven to 375°F. Butter 2 baking sheets. Whisk together flour, cinnamon, baking soda, and salt in a bowl. Beat together butter, sugars, egg, and vanilla in a bowl with an electric mixer at medium speed until pale and fluffy, about 2 minutes. 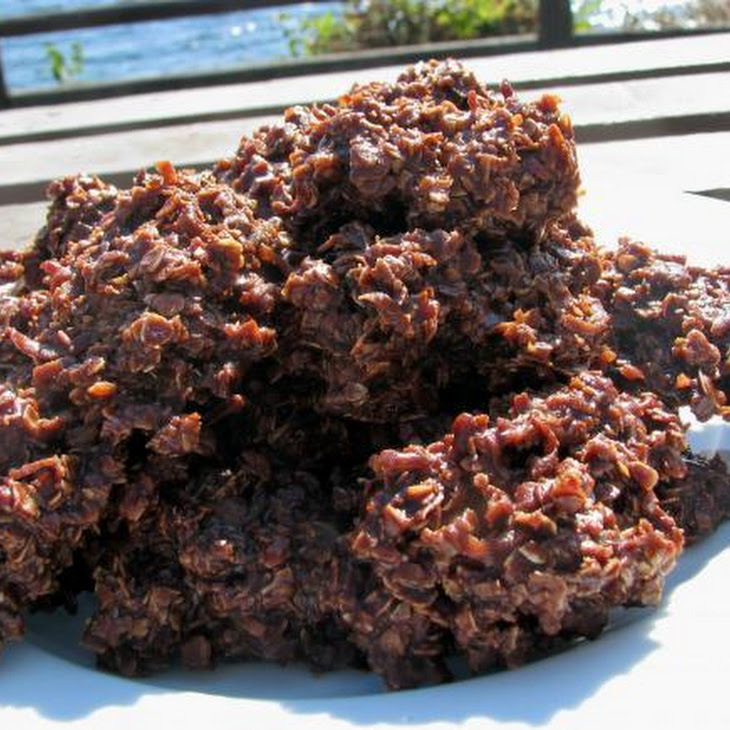 Mix in carrots, nuts, and raisins at low speed, then add flour mixture and beat until just combined. Drop 1 1/2 tablespoons batter per cookie 2 inches apart on baking sheets and bake, switching position of sheets halfway through baking, until cookies are lightly browned and springy to the touch, 12 to 16 minutes total. Cool cookies on sheets on racks 1 minute, then transfer cookies to racks to cool completely. While cookies are baking, blend cream cheese and honey in a food processor until smooth. Sandwich flat sides of cookies together with a generous tablespoon of cream cheese filling in between.